Given the very strong correlation of the Yen crosses to the equity markets, this week’s price action will largely be influenced by events in the equity markets and, in particular, tied to the quarterly earnings season in the US. 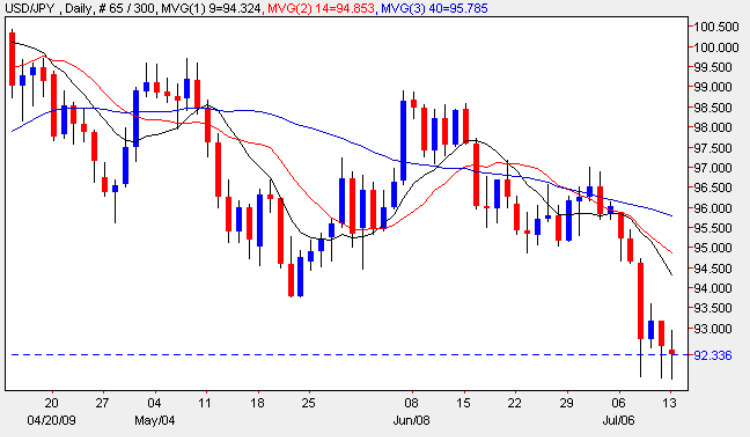 Friday’s candle ended the session marginally lower but with a deep lower wick and whilst this reinforced the surge in buying of the Japanese Yen as a safe haven, it failed to follow through in a dramatic way. Indeed the low of the day aligned precisely with last Wednesday’s low and this has been replicated for a third time in trading this morning suggesting that the price point just below 92 has found a modicum of support. Indeed should this prove to be confirmed then we will have a classic tweezer bottom for Friday and Monday’s candles which could indicate a short term reversal. In the medium term should the earnings in the US equity market prove to be far worse than expected then we should expect to see further Yen buying as investors flock to safe haven ports and reduce their appetite for risk accordingly.